This is a wonderful medieval gold finger ring, dating to the 13th - 14th century. The ring has a simple pie-crust bezel, set with a dark red garnet gemstone. The edge of the bezel rubbed over the stone, that appears to have dropped slightly due to the foiling deteriorating in the ground. The stone seems stable, not loose so can still be worn with care. 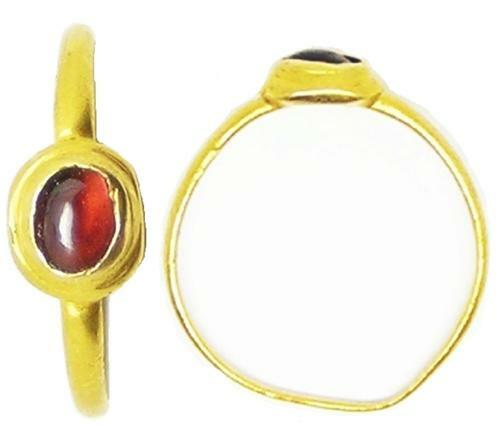 This type of ring was in fashion from the 12th century, the main emphasis to focus the eye on the gemstone, rather than on an elaborately decorated bezel (as with later pieces). The simplicity of design reflects the pious period of its birth, a time of Crusades, plague and great social change. The gemstone set into this ring is typical of the English taste, a garnet being rather more obtainable than a highly prized red Ruby. As such this is a great example of a more affordable medieval jeweled finger ring, of the type worn by lower nobility, Knight's, Lady's and the merchant class of northern Europe.